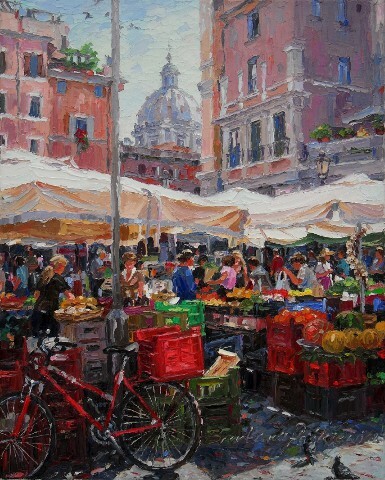 Barbara Jaskiewicz’s cityscape “Campo de’ Fiori” (19.7”x15.7”) has been accepted into Salon International 2013 at Greenhouse Gallery of Fine Art, San Antonio, Texas. Exhibit Dates: April 13 - May 3 , 2013. Barbara JASKIEWICZ-SOCEWICZ was born in Wroclaw (Poland), the city in which she still lives today. She graduated from the Wroclaw University of Technology with a BA in Architecture. She paints in oils and watercolour and she also draws. Her subject matter is wide ranging, beginning with landscapes inspired by the noble sceneries found in the south of France, wild Alpine meadows or the picturesque valleys of the Tatra Mountains. Gardens and park promenades scattered within the trees of ancient forests, landscapes of Silesian lowlands and of Lubelszczyzna (situated in SE-Poland) appear to an equal degree. The landscape compositions are joined by genre scenes of picnics, portraits of ladies in hats and of children picking flowers. The extraordinary charm of peonies, sunflowers, roses and asters provides great inspiration for extended, delicate and elegant flower paintings.Her portraits emanate a subtle colouring and delicate modelling. In her cityscapes, ancient Provencal towns and Mediterranean ports are portrayed most often. The crowded streets and squares of the picturesque Cracow, the bridges and canals of Venice and city scenes from Ostrow Tumski in her home town of Wroclaw are all frequent themes. She applies the oil paint with a palette knife, thus ensuring a rich and intriguing texture. The impastos create pastoso, provoking an additional reaction, a feature particularly apparent in her marine scenes. Barbara JASKIEWICZ's oil paintings have been shown since 1984 in frequent solo exhibitions in numerous galleries specialising in contemporary art. She is recognised as a professional painter by the Ministry of Culture and Fine Arts. The works presented on this website, painted between 1985 and 2008, should not be construed as a commercial offer. They come from private collections from all over the world. I have been gifted with a passion for painting and an astute power of observation. On my impressionist canvases I strive to portray a moment’s beauty or meticulously depict the reflections of flickering light. I am inspired by the surrounding world, and the process of painting is a happy journey in quest for unity and harmony. My aspiration is that my art will stimulate positive feelings. I have chosen a palette knife as it’s a perfect tool for creating oil canvases. This technique makes my painting emanate pureness of colours and true joy of life. For me a painting is a palette of colours, on which I can freely mix them, albeit without neglecting the drawing. Each element of a composition is given appropriate attention. In the “Treatise on Painting” by Leonardo da Vinci I’ve found a number of helpful hints on this. Painting is for me very much like music: it has its tones, hues, accents and a mood.